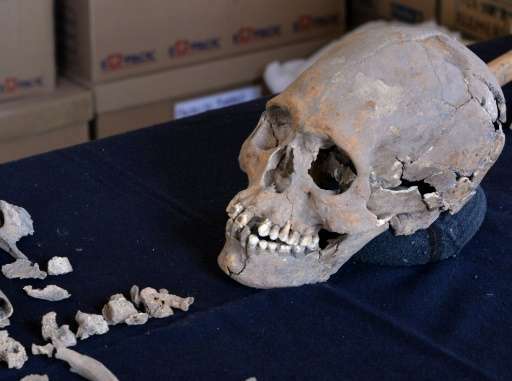 Archeologists have discovered the 1,600-year-old skeleton of an upper-class woman whose skull was intentionally deformed and teeth were encrusted with mineral stones near Mexico's ancient ruins of Teotihuacan. The woman, between 35 and 40 years old when she died, was buried with 19 jars that served as offerings, the National Anthropology and History Institute said. Her cranium was elongated by being compressed in a "very extreme" manner, a technique commonly used in the southern part of Mesoamerica, not the central region where she was found, the institute said in a statement. Although other intentionally deformed skeletons have been found in Teotihuacan, this one—dubbed "The Woman of Tlailotlacan" after the neighborhood where it was found—is among those with the most deformations. 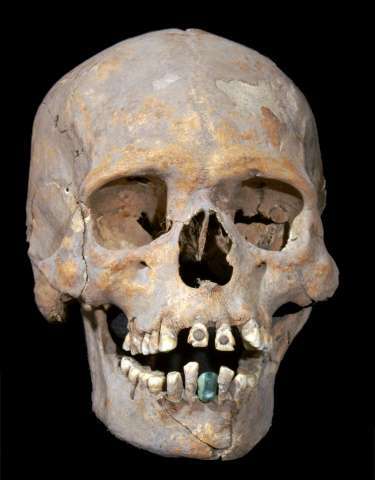 Another distinctive feature, showing the woman was a "foreigner" in Teotihuacan, is the two round pyrite stones encrusted in her top front teeth, a technique used in Mayan regions in southern Mexico and Central America. She also wore a prosthetic lower tooth made of a green stone known as serpentine. The enigmatic pre-Hispanic city of Teotihuacan, some 50 kilometers (30 miles) north of Mexico City, thrived between the first and eighth centuries, after which its civilization vanished. Its two majestic Sun and Moon pyramids are major tourist attractions. I wonder how the bottom tooth and the stones in the upper teeth were kept in place.